Tea anyone? Disneyland now offers a wonderfully sophisticated Classic Afternoon Tea at Steakhouse 55 in the Disneyland Hotel. The settings are beautiful, the food is delightful, and the tea is flavorful and tasty. But if you’re looking for a character experience, you won’t find it here. 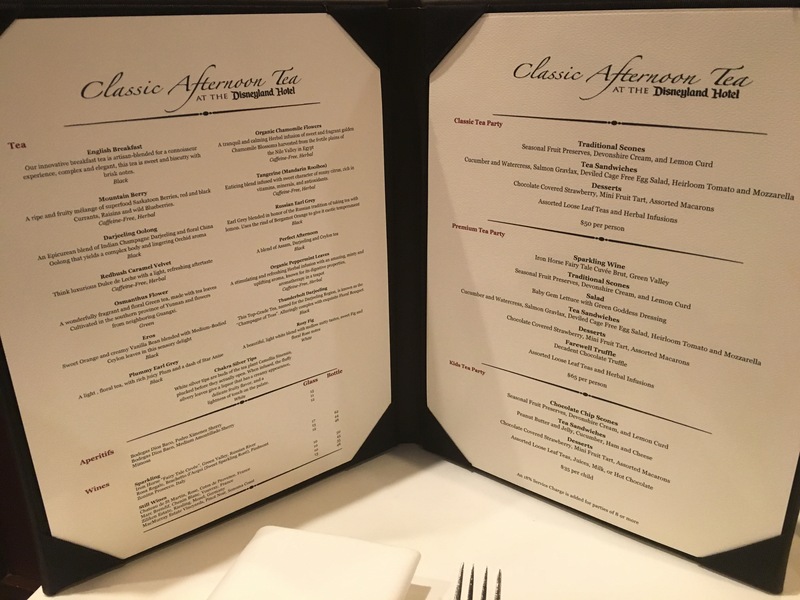 This is truly a classic afternoon tea highlighted by Disney’s characteristically amazing guest service but without visits from Minnie or the princesses. It is a delightful experience for the tea lover or someone who just wants to see what it’s like to have a traditional tea service. Reservations are definitely required and are often booked well in advance. This popular event only takes place on Fridays, Saturdays, and Sundays from noon to 3pm so if your schedule allows for it, make sure to set aside about an hour or two for all the fun. There are three options to choose from (and you don’t have to make the choice until you arrive. The $35 Kids Tea Party, the $50 Classic Tea Party, and the $65 Premium Tea Party. All of them serve scones, tea sandwiches, desserts, and of course, tea. And if by chance you don’t like tea you can have milk, juice, or hot chocolate (I got the hot chocolate and it was super good – the whipped cream was so thick it lasted while I had three full cups)! There are 15 different teas including varieties of black, caffeine-free herbal, green, and white. Along with my hot chocolate I tried some of my daughter’s English Breakfast tea (very good), Eros tea (vanilla with a hint of fruit), and Mandarin Rooibos (an excellent tangerine type). There is no limit to the tea you can try but the finger foods are not replenished. The Kids Tea Party comes with slightly fewer pieces but a much bigger Mickey chocolate chip scone. The tea sandwiches are peanut butter and jelly, ham and cheese, and cucumber. And the desserts are a fruit tart, a chocolate covered strawberry, and a macaron. 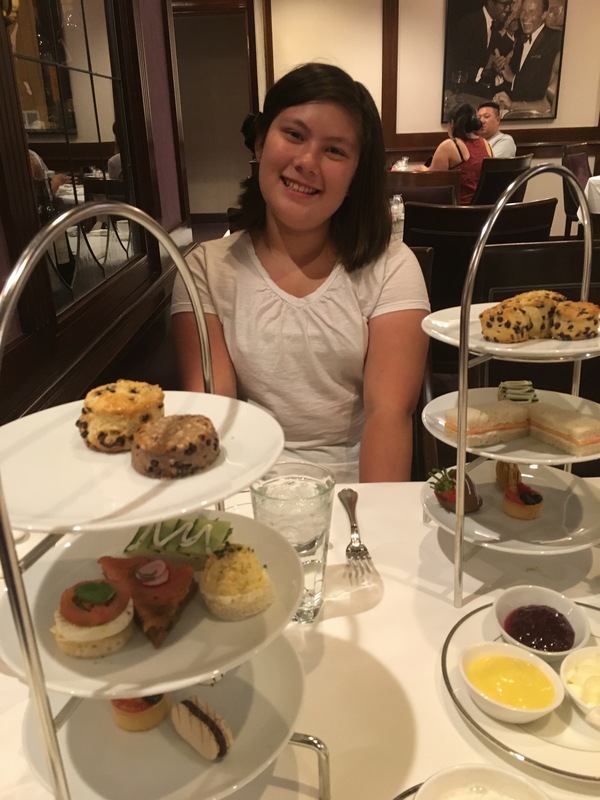 The Classic Tea Party features two smaller scones – one chocolate chip and one specialty (I think mine was chocolate chip with raspberry). In place of the PB&J and ham and cheese there is a deviled cage-free egg, salmon gravlax, and tomato and mozzarella. By far my favorite was the salmon gravlax. For dessert each serving had an additional macaron. The Premium Tea Party was exactly like the Classic except you were served a glass of sparkling wine along with your tea, a salad, and a gift of two truffles at the end. For me, the salad was not exceptional and although I loved the truffles, I walked away full enough that I had to save the sweets for later. Because they pull from an assortment of macarons, you might get different ones each time. The same is true about the chocolate covered strawberries. We ended up with two milk chocolate and one white chocolate covered strawberry. Although we were happy with our selections, I’m sure you could request different kinds if you were so inclined. My daughter isn’t a PB&J fan so they gave her an extra ham and cheese and when she didn’t like the cucumber sandwich our server offered to give her another one. The service is more than excellent. We had such a good time. If you’re wondering if it is appropriate for kids, there were families of all sorts in attendance. Families with small children as well as older kids. Have allergy concerns? They also cater to those as well. My wife likes to eat gluten-free and her plate was just as yummy as ours. The bread was a little more dry but exactly what you’d expect from gluten-free bread. They even had a fruit tart for her that looked so good she was worried they might not have given her the gluten-free option (but they did). They offer vegan options as well and a friend of mine with a seafood allergy had no problem at all. If you’re in the mood for a great tea experience with exceptional service, give the Disneyland Classic Afternoon Tea a try! Do you have to dress up or are you supposed to dress up? You don’t have to dress up at all, but a number of people did. I think the it was just no ripped jeans, tank tops, flip flops, etc. But you don’t have to be super fancy either. I went in khakis and a polo top. My wife and daughter wore dresses, but you certainly don’t have to. i can’t wait to try this o my next visit to Disneyland. I’ve heard quite a few good reviews on it. The food looks very delicious. It was and it was a lot of fun, too. Let me know how you like it!